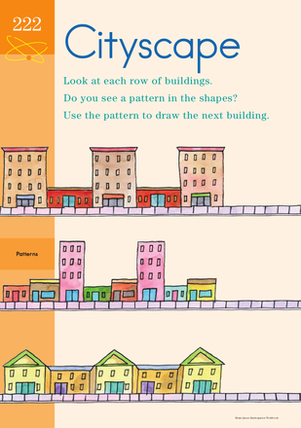 To finish this exercise your kindergartener will need to look at the series of buildings, decide what comes next in the simple series, and then extend the pattern by drawing the building at the end of the line. Pattern recognition is an important early math skill! With this worksheet, your child can review her colors and shapes as she completes each pattern sequence. 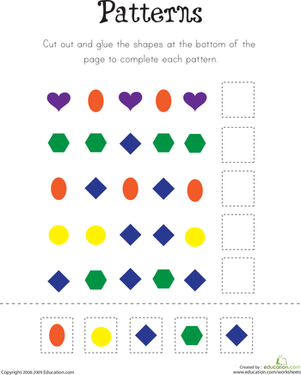 Teach your child to find the pattern with this fun and playful worksheet. Help your kindergartener learn the important skill of analyzing a pattern by finishing each pattern sequence. Trace the triangles in the picture to complete the mountains in the background. Just like the seasons, the pictures on this garden-themed worksheet come around in a pattern. This math worksheet teaches your kindergartener about patterns. Setting up flowers in a pattern is a great way to make a garden beautiful. Let your young one help the gardener create pretty patterns on this worksheet. Give your child a creative and challenging way to learn about pattern sequences! He'll use his imagination to create his own patterns. This printable will challenge him to find the pattern in a sequence. Here's a great worksheet that combines pattern-learning with the fun of shapes! Here's a great activity that combines fine motor skills, patterning practice, and the chance to learn some common street signs!